During the 5 or 6 years that I have been building this website I have come across small ‘snippets’ of information about how Platt Fields, (and Hall) were used during WW1. However, information has been difficult to find probably because of ‘DORA’. “The Defence of the Realm Act (DORA) was passed in the United Kingdom on 8 August 1914, four days after it entered World War I. It gave the government wide-ranging powers during the war period, such as the power to requisition buildings or land needed for the war effort, or to make regulations creating criminal offences. The law was designed to help prevent invasion and to keep morale at home high. DORA ushered in a variety of authoritarian social control mechanisms, such as censorship. It imposed censorship of journalism and of letters coming home from the front line. The press was subject to controls on reporting troop movements, numbers or any other operational information that could be exploited by the enemy. Nevertheless, the impact on the effective ban on reporting various local events does rather hamper research. Three items that I have found in respect of Platt Fields, and another regarding Platt Hall are interesting small items of local history that are worth recording. 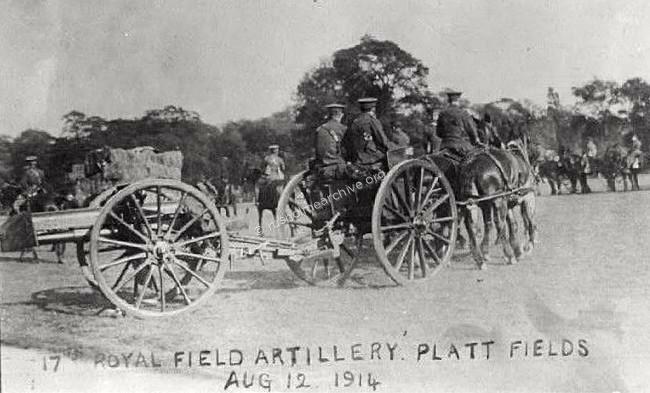 In the photograph below, dated August 12th 1914, there is obviously military activity in Platt Fields; an article published in the Manchester Courier on August 14th describes what can be seen in the photograph. 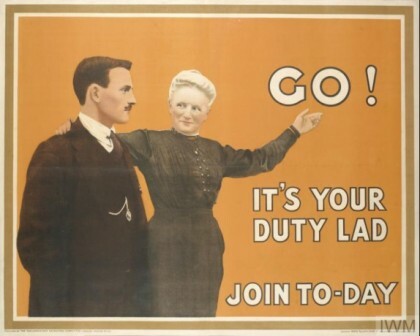 I would of thought that this might have come within the remit of Dora and censorship, but perhaps at this early stage in the war there was more interest in talking about the need for volunteers with good dentures! 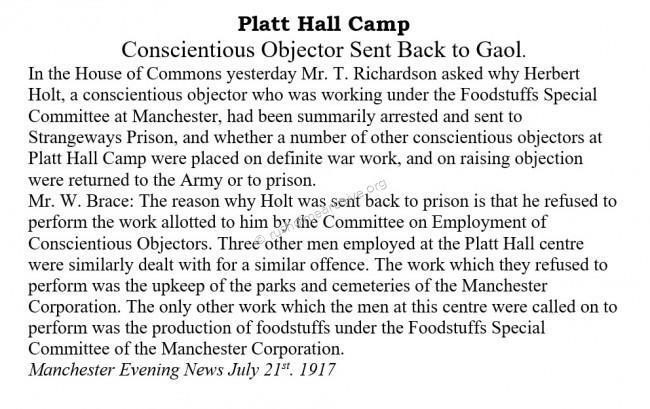 The Platt Fields Camp, Manchester Courier, Aug 14th 1914. Public interest in the encampment of the 2nd Brigade of the East Lancashire RFA at Platt Fields showed no signs of abatement, and during the whole day crowds were continually filtering through the park watching the men at their work among the horses and guns. The whole of the Brigade – 680 men, 500 horses, and 12 guns with ammunition – is now quartered there.During the day, General Douglas, the General Officer commanding the East Lancashire Division, and Brigadier D’A King, commanding the divisional artillery, visited the camp and saw the men at work. 1. No applicant can be attended to unless he produces a certificate from the examining medical officer at one of the official recruiting depots. 2. Artificial teeth cannot be supplied unless the applicant or his friends can make a contribution of 15 shillings towards the cost of materials. 3. Applicants may apply on weekdays between 9 and 1 and 2 to 5; Saturdays, 9 to 1. Establishing this camp in Platt Fields at the outbreak of the war was not without some friction with the military authorities. The Parks Committee considered the following correspondence during committee meetings in the autumn of 1914. SANITARY ARRANGEMENTS FOR TERRITORIAL CAMP. The City Architect reports that at the beginning of August he received an urgent request from Lieut. 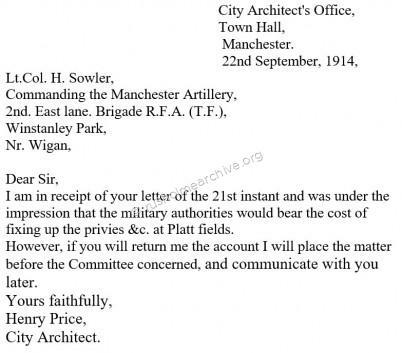 Col. Sowler, Commanding the Manchester Artillery, to erect temporary privies, urinals and washstands for the use of the Territorials then in camp at Platt Fields. He accordingly gave instructions to Messrs. George Ryder & Son, of Wilmslow Road, Rusholme, and the work was proceeded with immediately. Messrs. Ryder's account for this work amounting to £29. 11. 4 was forwarded to Lieut. Col. Sowler on the 19th inst., and the City Architect submits herewith copy of correspondence which has passed on the matter, together with the account. Colonel Sowler was very indignant about this request for £29.11.4d and below is his reply! The City Architect sent a tactful reply……………………. 'Conveniences for the Military in Platt Fields’. 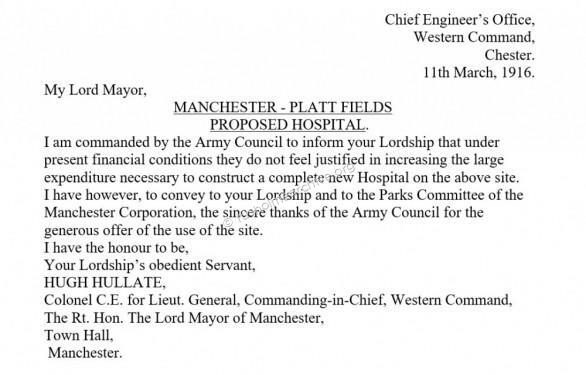 'Every facility would be afforded to the Military Authorities for the use of Platt Fields if they so desired'. The Parks Committee duly resolved to authorise the Treasurer to pay George Ryder the sum of 29 pounds, eleven shillings and fourpence! When we read the about the dispute regarding the cost of the work, £29.11s.4d, it is worth remembering that it was just over a century ago when values were very different. Using the quite remarkable website, ‘Measuring Worth’, (https://www.measuringworth.com/), you can bring up to date the values of that seemingly modest sum of £29/11/4d. RPI indexation alone increases the figure to £2,559.00, and if you use labour cost inflation it amounts to £9,515.00, – no wonder Lt. Col was very concerned! Manchester University Officer Training Corps. 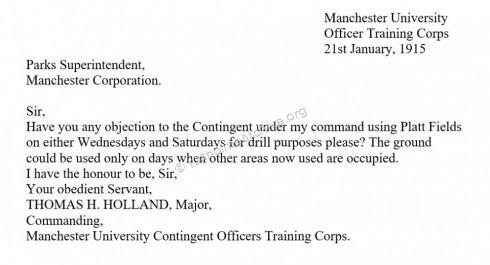 At the beginning of January 1915, the Officer commanding the Manchester University Officer Training Corps, Major Thomas Henry Holland, sent the following letter to Mr Pettigrew, Parks Superintendent. Major Sir Thomas Henry Holland, KCSI, KCIE, FRS, FRSE, LLD, 1868 – 1947 was a force to be reckoned with; biographical note from Wikipedia. 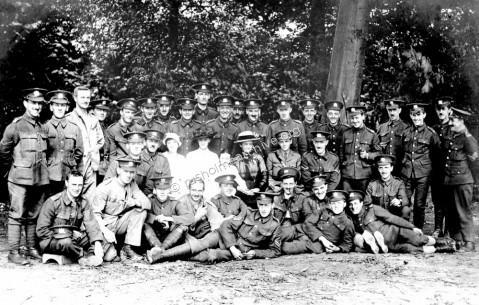 The photograph below was taken in 1917 and shows a group of young students who were part of the Manchester University Officer Training Corps. The photograph was taken at the sports pavilion in the grounds of ‘The Firs’, Fallowfield, at the university playing fields. There was also, I believe, a German prisoner-of-war camp in the same grounds. 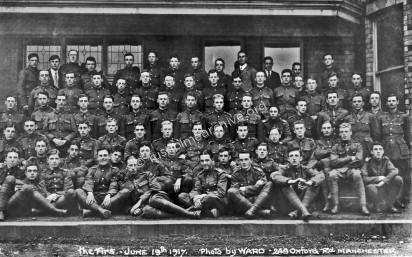 The photograph identifies a group of just over 70, there were at varying times between 250 – 300 officer cadets, during WW1 just over 300 died on active service. As this photograph was taken in 1917 you might wonder if they did see active service and return to finish further studies? I can only imagine that the following matter had come about because the newly appointed General Parks Superintendent, Mr Pettigrew had been inspecting the various properties and parks that he was now responsible for. 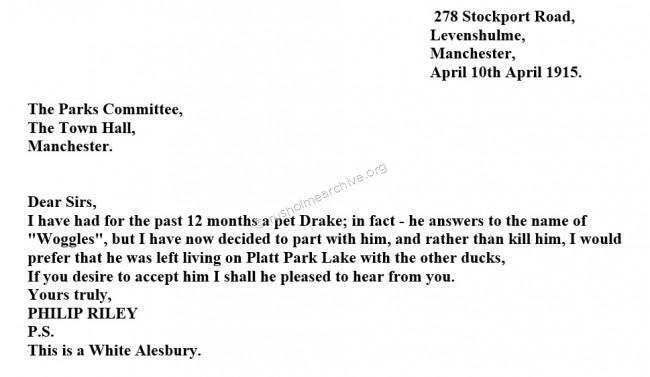 At the September meeting of the Parks & Cemeteries committee the members considered a letter that had been sent to one of its members, Alderman Ashton. The Committee were clearly unhappy with this ‘informal’ arrangement by the tenant who had been managing the refreshments on the ground floor at Platt Hall. 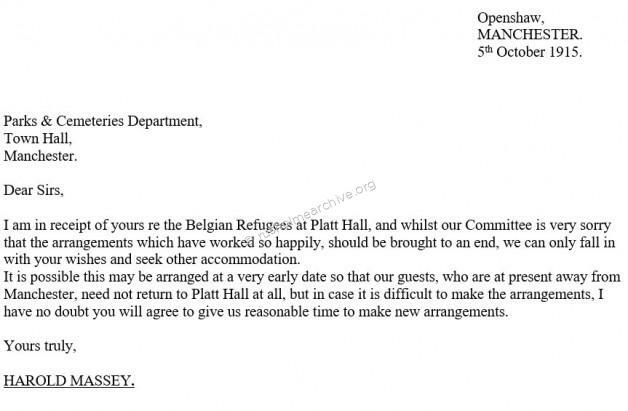 Prior to the billeting of the Belgian refugees at Platt Hall another memo in the Committee minutes had already determined that all catering arrangements in the Parks would be under the direct control of the Parks Committee. ‘That no tenants in any of the houses in the Parks be allowed to sub-let any portion of such premises to lodgers nor undertake any catering for the public without the sanction of the Committee’. 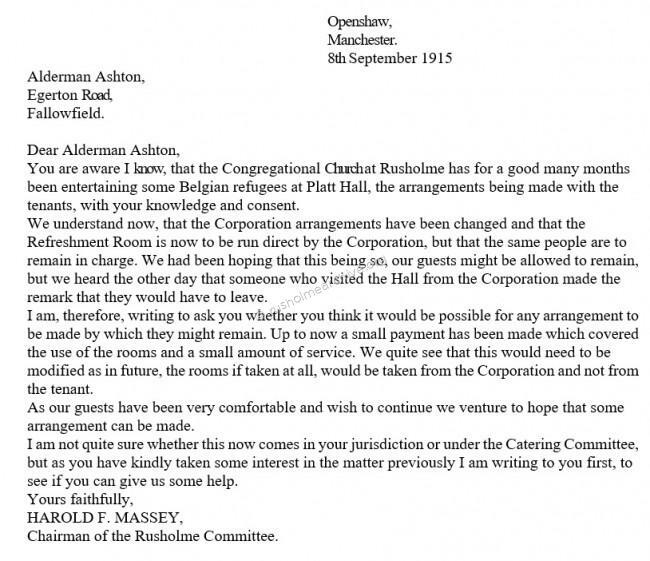 The reply from Harold Massey of the Rusholme Congregational Church seemed to be quite fair, asking for a little leeway about how soon the Belgian refugees would have to leave. ‘That the Committee cannot see its way to comply with the request made in the letter now read and that a reply to this effect be forwarded by the General Superintendent’. On another page on rusholmearchive.org I have written about some of the Military Hospitals that were established in Rusholme. One project not realised was to build on Platt Fields, a hutted hospital for (initially), 500 wounded men – however the plans that were discussed and submitted to the City Architect and City Surveyor envisaged this hospital expanding to accommodate 3000 men. The letter below, dated 18th October 1915, was a formal letter outlining the medical needs of the Military Authorities. The plans were sufficiently advanced to the point that the City Surveyor was advocating the sewage outfall would have to be linked into the Wilmslow Road mains as the Platt Lane system would not be adequate. However, after several months of discussions the overall cost was considered too much and the letter below brought closure to the planned hospital. 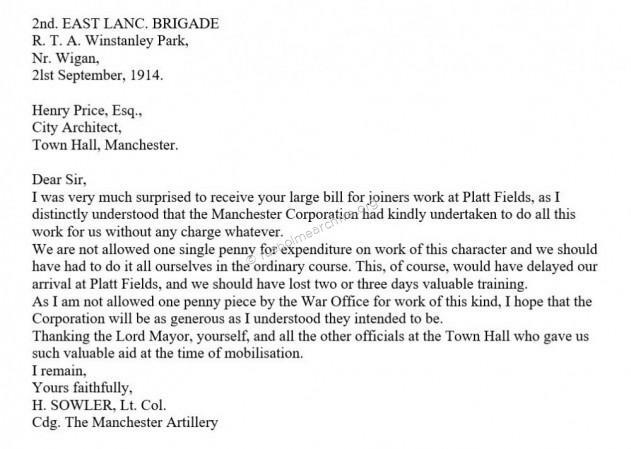 Within two months there was further activity in Platt Fields that seems to be well documented, I have found the following information from the Manchester Parks Committee 1916 minutes. The Parks committee duly considered the matter and appointed a sub-committee to meet with Captain Higham; there seemed, however, to be a feeling amongst committee members that land in Levenshulme at Green Bank Fields would be more suitable. “The Deputy Chairman reports that the Special Sub Committee met Captain Higham at Green Bank Fields on May 13th. 1916, but as he was not satisfied with the conditions existing there the Committee proceeded to Platt Fields to consider any suggestions he had to make. After going very fully into the question the Sub Committee feel that they are only justified in recommending that the Committee adhere to a suggestion made at the last meeting viz: to set aside a portion of Green Bank Fields for this purpose. Deputy Chairman of the Parks Committee. 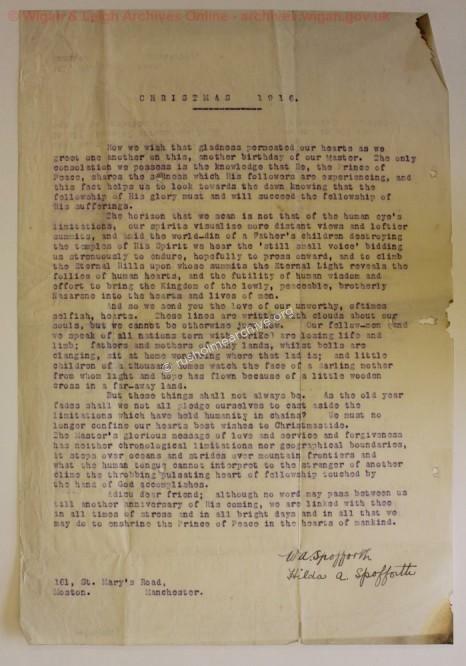 This suggestion certainly did not meet with agreement from Captain Higham and he sent the following letter to the Chairman of the Parks Committee on the 31st May 1916. I note your remarks relative to the digging in Platt Fields. May I point out that it is absolutely essential that we should get land for this purpose very much nearer than Green Bank Farm. Under the impression that the rough ground at Ash Fields would not be objectionable to you I have already made a start in this place. This appears to have been a mistake.I have, therefore, had to lengthen the soldiers working day by two hours in order to allow for the time marching to their present digging place, 'pending your early decision’. 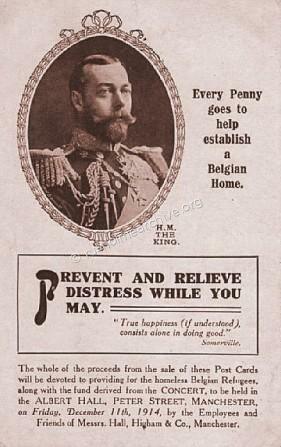 This extension of the time is a great hardship on the boys, and will undoubtedly swell the sick parade, as not only is another two hours a day too much on the present programme, but a proper meal cannot be obtained in the middle of the day; a very important point with men fresh from civilian employment. 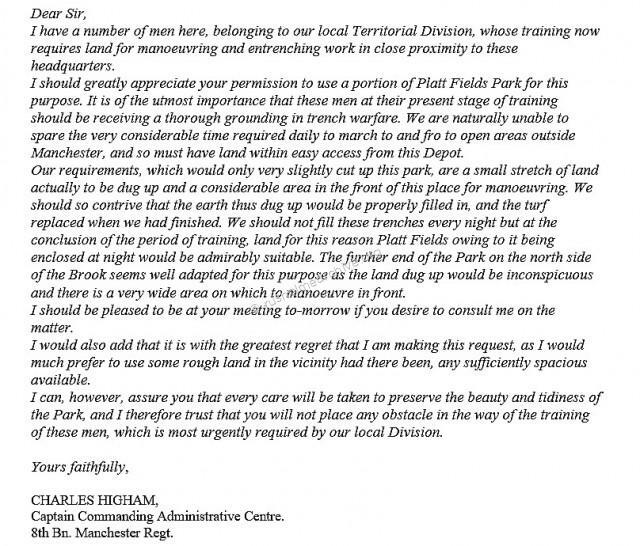 Altogether I do not know of a more convenient piece of ground, except of course the football pitches in Platt Fields, and as you do not desire these disturbed I hope you will assist us by sanctioning the not very large amount of rough land required at Ash Fields. 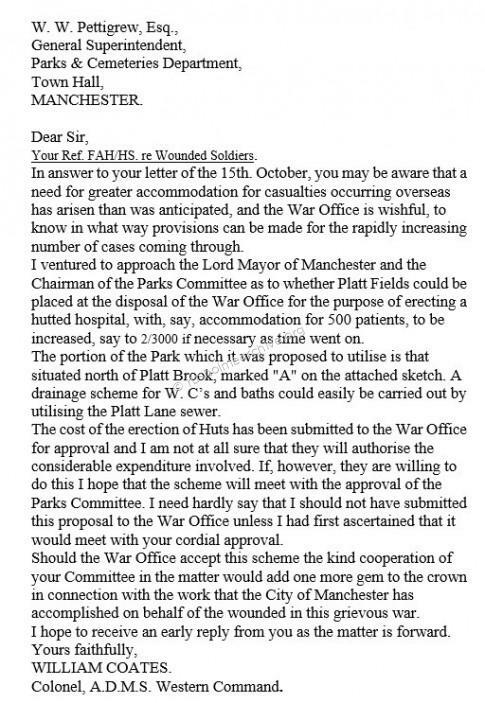 Some ten weeks later the following letter, dated 18th August 1916, was sent on behalf of Captain Higham and in due course the Parks Committee considered the proposal at their Sept. meeting. 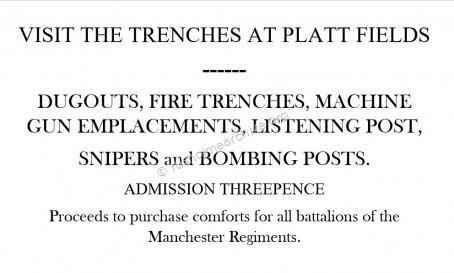 It has been suggested to me that the trenches made at Platt Fields Park by the boys at these Headquarters might be utilised for the purpose of raising money for charitable purposes, such as the Blinded Soldiers and Sailors Fund. We have already been instrumental in raising about £600 for this fund, which is a most deserving cause. We shall be pleased to exhibit these trenches provided you are prepared to defray the cost of enclosing them. A considerable sum, however, would be required for ready money expenses, and the sum of £50 would be entailed. If this scheme were properly worked I do not see why a very handsome sum should not be raised for this charity. “The Corporation Parks Committee decided today, to open the newly-constructed trenches at Ashfield, Rusholme, to the admission of the public. A small charge will be made for admission to the trenches and the proceeds divided between the fund for providing comforts to men of the 8th Manchesters at the front and the Lancashire Soldiers' Comfort Fund”. With surprising speed the notice below was published on the 20th Sept in the Manchester Evening News, and reported on the 22nd Sept in the Guardian and the 24th in the Sunday Mirror, both articles being accompanied by photographs. (Sir George Alexander, 19 June 1858 – 15 March 1918, born George Alexander Gibb Samson, was an English stage actor, and theatre producer). The photographs below were sent to me by Tim Burdett who has kindly allowed rusholmearchive.org to display the images. 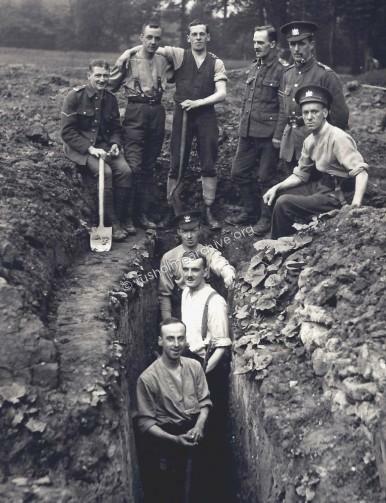 In the two images, it is very clear that men are digging trenches. Tim told me that they had belonged to his grandmother who said they were taken during WW1 and that her husband, (amongst others) were “Digging trenches in Platt Fields”! “Ashfields was the property of Sir Edward Donner, and the land belonged to Mr Smith-Carington of Grangethorpe House. 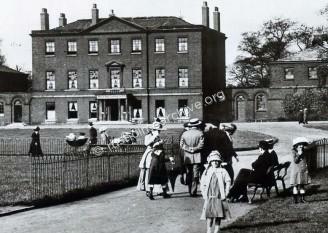 Ashfield House and grounds were freehold and covered an area of three and a half acres. The plot of land measures seven acres, and is separated from the park by a simple fence. There are 360 fine trees on the land, and the rurality of the scene is enhanced by the presence of a rookery.” (you can read more about Ashfields on the page; ‘Fallowfield Brow’). It does seem to me that the photographs have been taken in the plot of land described above and are a very valuable part of Platt Fields history. Whilst there is no specific written evidence regarding the subject of the photographs I’m quite prepared to believe the story from Tim Burdett’s mother! 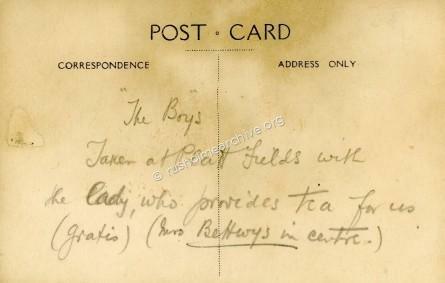 This third photograph that I have and is shown below has a brief message on the rear that refers to the ladies in the picture who provided tea for the troops. 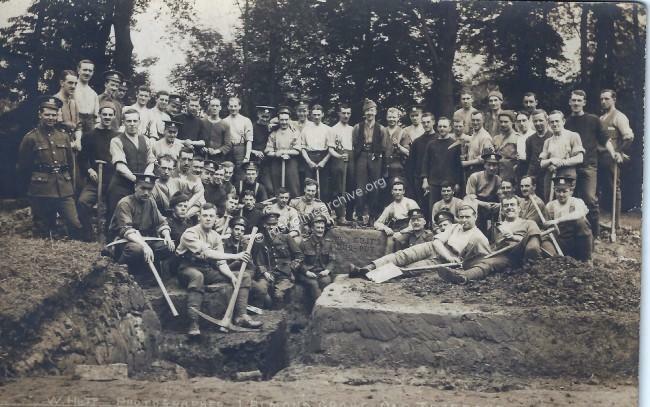 Whether this photograph is of men who appear to be digging trenches, (or some other military task that is not identified) but clearly they were in Platt Fields for some military reason ? 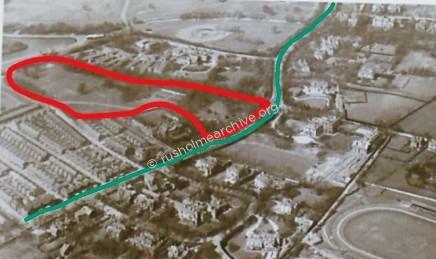 The aerial view shown below with the Ashfield plot outlined in red, the green line represents Wilmslow Road. During the first day the cost of admission to the trenches was one shilling, another notice in the Manchester Evening News, (below) dated 6th October 1916 does show the charge had been reduced to three pence…………….. 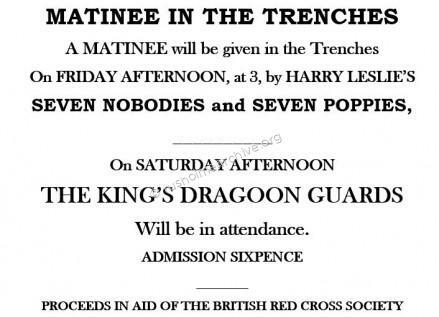 The notice below was placed in the Manchester Evening News on 27th June 1917, true to his usual charitable form Harry Leslie was always prepared to help out! 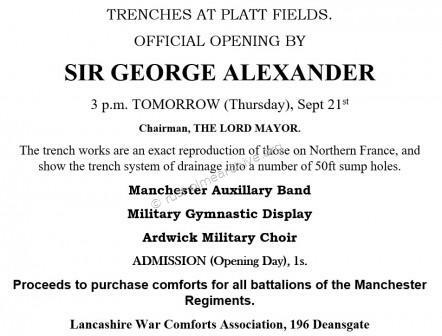 I have searched both minutes of the Parks Committee and the Manchester local press to see if there was any reference as to when the trenches were filled in, but nothing to report about this final aspect of this story. 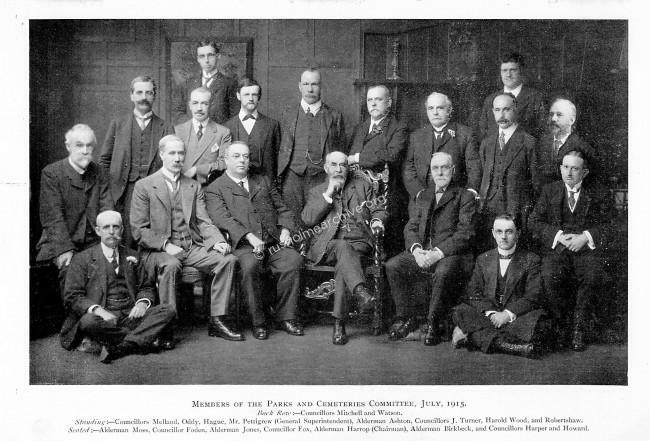 At this point I thought that it might be appropriate show a photograph of the Parks and Cemetery Committee that was published in the 1915 Parks Annual Report. In the photograph, the Chairman is centre, seated in the larger chair, whilst behind him, standing to his left is the General Superintendent, Mr Pettigrew. 'WOGGLES', A Drake for the Lake!! 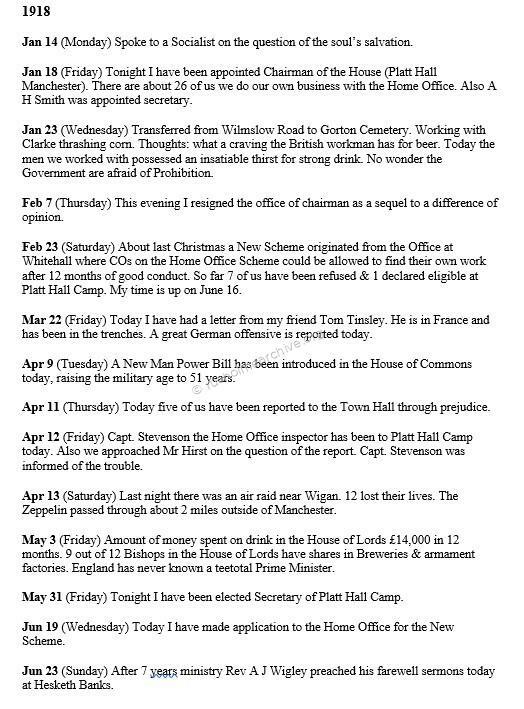 Whilst the Committee had many difficult decisions to consider I thought the following letter on their Agenda in April 1915 might have come as light relief! 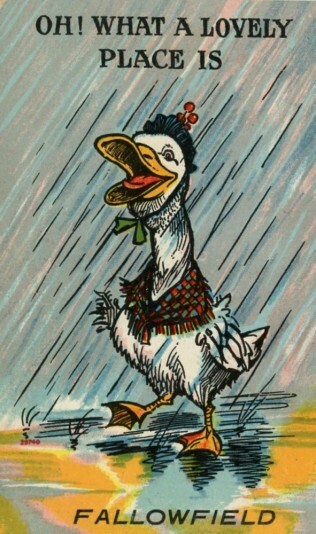 If you happen to be looking at the ducks on the lake at Platt fields you might just see a descendant of ‘Woggles’………………………. In the early part of 1916 Manchester City Council was becoming aware that certain basic foodstuffs were becoming scarce and expensive, particularly, according to the Council minutes, “Among the poorer classes”. Sugar, milk and flour was referred to, besides fresh vegetables and potatoes. The Council duly set up a Sub-committee with leading members of the Council to take important decisions. The sub-committee was called ‘The Foodstuffs Special Committee’ and it was particularly aware of the acute shortage of labour in the agricultural and horticultural undertakings in Manchester. Raising this matter with the Ministry of Food, there was, as a consequence, correspondence with the Home Office who sent the letter below. It broadly outlined what had become known as ‘The Home Office Scheme’. 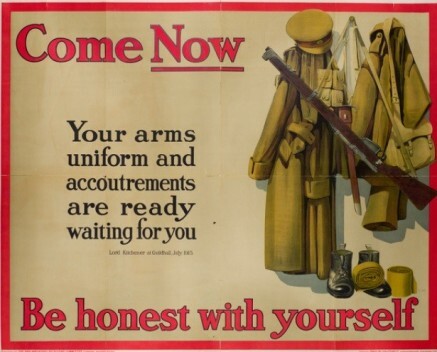 (In June 1916, the Government introduced a scheme to try and reduce the numbers of conscientious objectors in prison. All imprisoned conscientious objectors were to have their cases reviewed. Those believed to be genuine would be released from prison, provided they accepted to undertake work of "national importance" under the control of a new civilian committee, in what came to be known as the Home Office Scheme. Any man who refused, or whose plea of conscience failed to satisfy the Tribunal, would be returned to gaol to complete his sentence). I enclose a Memorandum showing in detail the arrangements applicable to the employment of small parties of conscientious objectors, but it may be of some assistance if I also state, more broadly than in the Memorandum, the position of affairs. All the men under the Committee are therefore of military age and most of them have been found fit for military service. In the main, therefore, they are well-fitted for employment and many of them are well educated and intelligent. The Committee has employed them, in obtaining road material, making roads, on public work such as reservoirs, and in timber cutting, etc. There is a strong preference among many of the men for work directly connected with increasing the food supply, and the Committee believe that they should can do good work in this direction. You will see from the Memorandum that the authority employing them houses, feeds, and pays them at the cost of the Committee, and credits the Committee with the actual value of the work done. The Committee are most anxious, for many reasons, to take every opportunity of getting men to work on the land, and sincerely hope you will be able to arrange for their employment. If at any time you would wish to discuss the matter with someone conversant with the manner in which existing schemes of employment are being worked, either I or Mr. Whiskard of the Home Office would be glad to see you or a representative". The Memorandum relating to the employment terms and conditions for the CO were quite comprehensive and detailed. The following paragraph is the basic terms but in addition there were extensive notes about time off and accrual of leave together with aspects of their detention as military prisoners under civilian control. 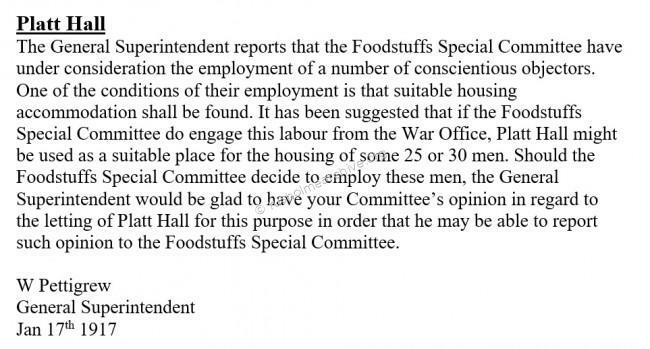 The Special Foodstuffs Committee considered the employment of Conscientious Objectors and resolved; ‘That under the direction of the Chairman and Deputy Chairman arrangements to be made for the employment of Conscientious Objectors’. The Special Foodstuffs Committee in Manchester was serviced by Mr William W. Pettigrew who was the General Parks Superintendent. Prior to working in Manchester, he had been Parks Superintendent at the City of Cardiff. There he had been appointed Parks Superintendent at the then very young age of 24. 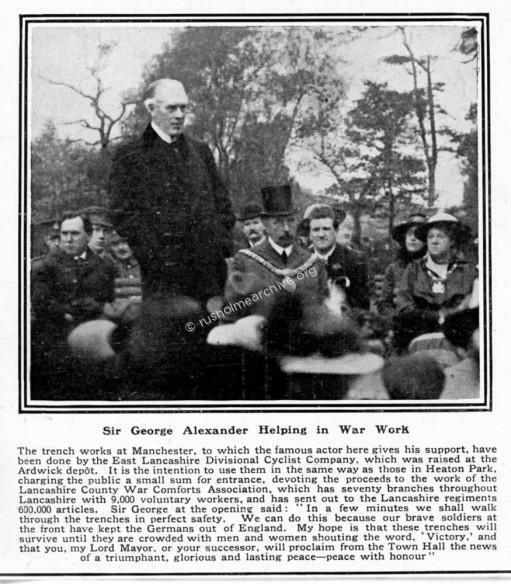 After 23 years in Cardiff he was appointed as the Manchester Parks Superintendent in 1915 and seems to have embarked on his new job with some considerable energy. The salary for this post was £500.00 per annum – a very substantial sum. Later in the year, the following report appeared in the Manchester Evening News on the 27th August, 1917, it was headed; ‘Control of Manchesters Food’. “The new Food Control Committee of Manchester, which was appointed at the request of the Ministry of Food, is getting to work as rapidly as possible.The members had before them at another meeting, to-day, the important question of the appointment of a chief officer to the committee. ‘That the General Superintendent be authorised to allocate such rooms in Platt Hall as he may think desirable for the purpose named in the report referred to in the above resolution’. When I first researched the minutes of the foodstuffs special committee I was confident that the Agent appointed, (as referred to in the notes below), was William Spofforth. "In view of the fact that the C.O’ s Camp is being brought to a close, the services of the Agent, Mr. W. A. Spofforth are being dispensed with. As he undertook certain work in the way of Supervising, fencing the allotments etc., it will be necessary for some other person to undertake that work. It is only a part time job and the Chairman suggests that it might be possible to put this work in the hands of Mr. Beal and to pay him a small additional remuneration of say about 17/- per week, which would be charged to the Cultivation of Lands Order Account. I have now found other information in the Peace Museum at Bradford, which clearly suggests that another person, a Conscientious Objector, called Mr F C Crowther may have been initially appointed to the post of Agent. I will be researching this further - meanwhile it does seem W A Spofforth was serving as Agent at the time that Platt Hall Camp was closed. Foodstuffs Special Committee; Conscientious Objectors. 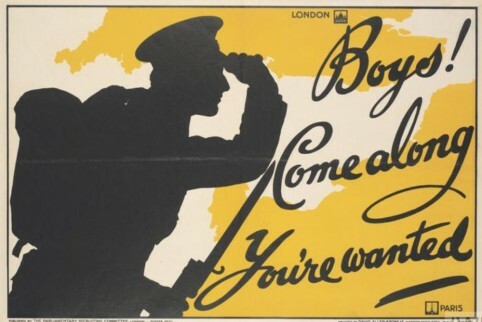 "As your Committee are aware the War Office has intimated their willingness to supply you with a number of Conscientious Objectors who are agreeable to work on the land. As it would be necessary for you to find suitable accommodation for these men if you engage them, the Parks Committee were, approached with a view to their giving your Committee permission to utilise Platt Hall for this purpose. At a meeting held on the 22nd inst. the Parks Committee agreed to let the Foodstuffs Committee have the use of the Platt Hall - under certain restrictions - in which to house these men. 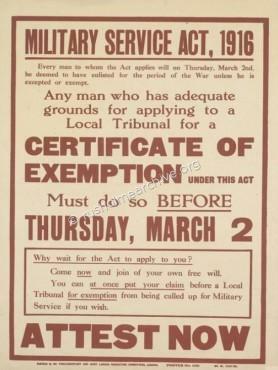 One of the conditions laid down by the Committee dealing with the employment of Conscientious Objectors is that one person must be made directly responsible to the Committee in London for the oversight of the men sent on to the land in this way. It will be the duty of this person to see that discipline is maintained and that all the conditions of labour are carried out, and that proper accounts of expenditure under different heads are, rendered to headquarters. RESOLVED:The appointment of a person to exercise an oversight of the Conscientious Objectors referred to be left in the hands of the Chief Officer. Accordingly, an agent was appointed to supervise the C.O.s at Platt Hall – I am confident the man appointed was a Mr. William Arthur Spofforth, his exact duties were not identified in any reports that I can find. Several questions can be raised – were the men expected organize their own accommodation, in terms of cleaning, laundry and cooking at Platt Hall? In reading some material about the C.O.s during this period it is quite probable that they organized their own committee to manage these matters. "When the planting season comes around they should prove very useful in hastening on the more laborious work which this entails". Click here for Robert Wright or read the briefing note below. Robert Wright was a Methodist Lay Preacher from Hesketh Bank near Preston. He was a Conscientious Objector, who having been imprisoned at Wormwood Scrubs for refusing to obey military orders, was offered the opportunity of accepting work of ‘National Importance’ under the Home Office Scheme. Robert Wright had kept a diary throughout most of his adult life and during 1916-18, when he was a C.O., he carefully recorded his experiences, detailing the very brutal treatment that, at times, he had been subjected to. 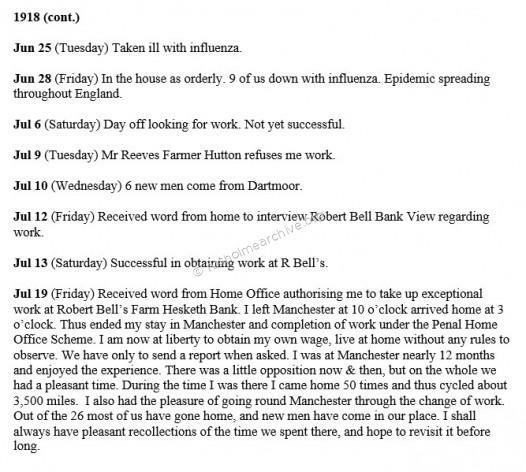 Dr. Jill Barber who edited the Diary has very kindly allowed rusholmearchive.org to reproduce below that part of Robert Wrights diary which refers to the time he spent at Platt Hall. 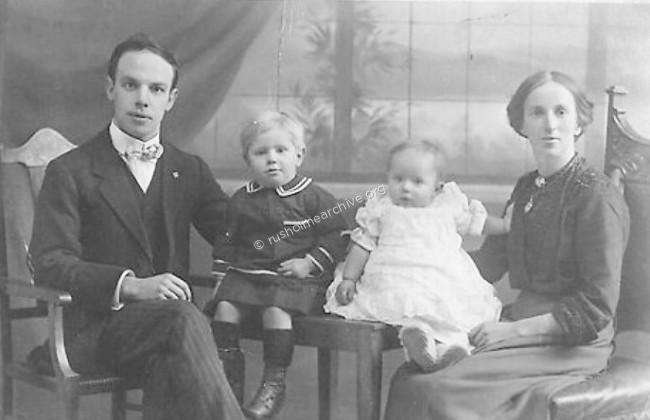 Dr. Barber has also provided rusholmearchive.org with a photograph, (below), of Robert Wright and his family. 20 Jan 1917: 'This morning at about 10 o'clock our second son Thomas Edward passed away at the age of 9 months 14 days. 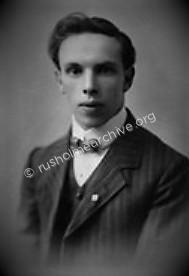 Photo above; Robert Wright (1889-1964), Conscientious Objector and Local Preacher. 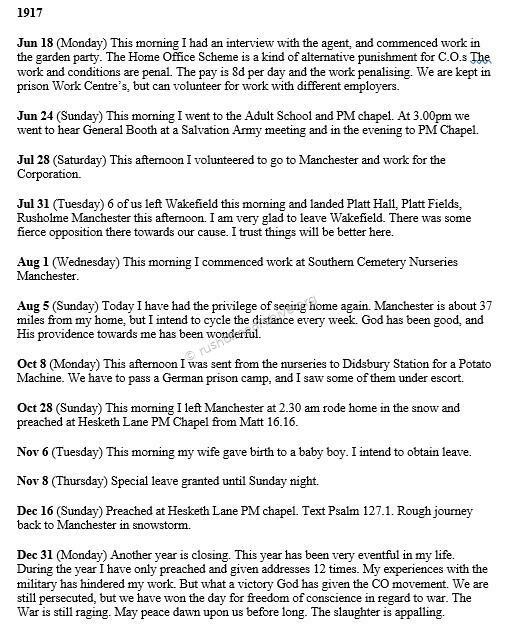 If you have now read the above extracts from the Diary I would urge you to visit the website, ‘My Primitive Methodist Ancestors and using the links that I have provided read all of the information about Robert Wright together with all of his diary. If I can return now to the appointment of Mr Spofforth I found myself wondering how and why Mr Pettigrew recommended this man. William Pettigrew’s marriage had been in a Presbyterian Church in Cardiff, if I conclude that he was Presbyterian I wonder if he had pacifist sympathies? I might generalize further and say that amongst non-conformists there was, perhaps, quite a strong movement of opposition towards the War. However, for a fairly senior member of the Town Hall staff it probably would not be appropriate to be openly holding such views in the prevailing atmosphere. Perhaps therefore, as William Pettigrew was living near the home of William Spofforth they had met in some religious gathering and the subsequent appointment was a way of helping the pacifist cause? There is no doubt that William Spofforth was a man of deep religious convictions, I am sure he was a pacifist and quite sympathetic to the plight of C.O.’s. In the Wigan Local History Archives there is some extensive material relating to Arthur Turtle, another C.O. who was in prison during Christmas 1916. In the archives, there is a letter headed Christmas 1916, from William Spofforth and his wife Hilda writing about their sadness at the state of the world. It is without any doubt a note demonstrating a very serious Christian Pacifist perspective. At the time Arthur Turtle sought exemption from military service he lived at an address in Moston, I am assuming therefore as William Spofforth also lived at Moston they must have already known one another? How we wish that gladness permeated our hearts as we greet one another on this, another birthday of our Master. The only consolation we possess is the knowledge that He, the Prince of Peace, shares the sadness which His followers are experiencing, and this fact helps us to look towards the dawn knowing that the fellowship of His glory must and will succeed the fellowship of His sufferings. The horizon that we scan is not that of the human eye's limitations, our spirits visualise more distant views and loftier summits, and amid the world-din of a father's children destroying the temples of His Spirit we hear the 'still small voice’ bidding us strenuously to endure, hopefully to press onward, and to climb the Eternal Hills upon whose summits the Eternal Light reveals the follies of human hearts, and the futility of human wisdom and effort to bring the Kingdom of the lowly, peaceable, brotherly Nazarene into the hearts and lives of men. But these things shall not always be. As the old year fades, shall we not all, pledge ourselves to cast aside the limitations which have held humanity in chains? We must no longer confine our hearts best wishes to Christmastide. The Masters glorious message of love and service and forgiveness has neither chronological limitations nor geographical boundaries, it steps over oceans and strides over mountain frontiers and what the human tongue cannot interpret to the stranger of another clime the throbbing pulsating heart of fellowship touched by the hand of God accomplishes. Adieu dear friend; although no word may pass between us till another anniversary of His coming, we are linked with thee in all times of stress and in all bright days and in all that we may do to enshrine the Prince of Peace in the hearts of mankind. CONSCIENTIOUS OBJECTORS’ CAMP. Most of the men from Platt Hall have now been transferred to other Work Centre’s under the Home Office and the remainder will be returned on Wednesday next. Instructions have been received from the Home Office to sell all the equipment by auction. The equipment is being scheduled and arrangements made accordingly. So, with that brief statement the Platt Hall Camp for Conscientious Prisoners was closed, and that small but significant snippet of Rusholme local history could easily have been overlooked if it had not been for the publication of Robert Wright’s Diary. Of those three men who are part of the narrative above I have found some information of their subsequent activity. On the premise there was only one William Arthur Spofforth in Lancashire I have found that the former overseer at Platt Hall Camp became involved locally, and then later, in national politics. For several years, he was a member of the Lancashire County Council, both representing Westhoughton as the County Councillor and working as a political agent for the Labour Party. In a 1925 Lancashire press report William Spofforth’s pacifist views re-appeared when the County Council proposed spending £50.00 on rifles, ‘So that young schoolboys could learn to shoot’. Understandably William Spofforth was very vocal in his opposition to this expenditure, however the wartime spirit still prevailed and the rifles were purchased. Later in the 1930’s during the period of Ramsay McDonalds ‘National Government’ William Spofforth followed McDonald and in 1932 became the Secretary of the National Labour Party committee. In 1935 he contested a parliamentary seat at Middlesborough but was not successful. William A Spofforth married twice, his second wife dying in 1953 at Westhoughton. Her probate record refers to her husband being a horticulturalist, (did he learn something in Platt Fields? ); William A Spofforth survived his second wife by 11 years, dying in 1964, the same year as Robert Wright (below). Robert Wright led a quieter life than the other two men – perhaps his experience during WW1 resisting the Military authorities and the state had worn down his spirit, but he served both as Secretary of Hesketh Bank Cricket Club and as a Parish Councillor. During his lifetime, he suffered two nervous breakdowns and very sadly, when he was 74, he took his own life. There are two further aspects of history regarding Conscientious Objectors and Rusholme. Harold Wild was a local man who worshipped at the Wesleyan Methodist chapel on Dickenson Road. However, he too like Robert Wright was convinced that the war was wrong and kept a careful diary which is also available to read online. Again, I would recommend Harold Wild's diary; It is particularly interesting because he refers to many of the meetings of different pacifist and political groups in the Manchester area. Harold Wild’s Diary – 1915 To read the Diary follow the link below. 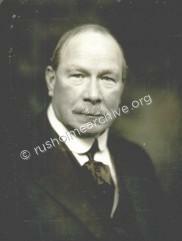 John Graham (1859-1932), was the Principal of Dalton Hall in Victoria Park, Rusholme. He was a prominent Quaker pacifist who during the War defended local conscientious objectors, and edited the pacifist journal Conscription and Conscience. During the war Dalton Hall and its Principal was something of a beacon to the anti-war movement and the Non-Conscription Fellowship. 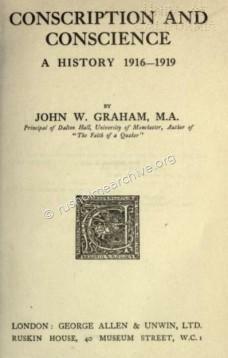 After the war in 1921 John Graham wrote ‘Conscription and Conscience’. The view of enforced conscription encountered by John Graham is well worth reading, you can easily read a copy by visiting the Internet Archive using this link, choose the format you prefer, (PDF, Kindle etc) and download the book. 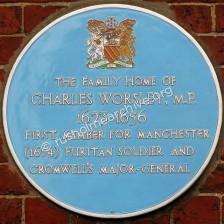 If you visit by Platt Hall you will see a Blue Plaque (below), referring to Charles Worsley whose family owned Platt Hall. I wonder if there should be another plaque, to commemorate those Conscientious Objectors who were billeted at Platt Hall and who bravely resisted the Military authorities and endured so much public opprobrium. In preparing this page I would like to offer my appreciation to the following for their help and agreeing to allow rusholmearchive.org use of their material. Alex Miller at Wigan Archives for his help with the Arthur Turtle Archive; Dr Jill Barber at My Primitive Methodist Ancestors for giving permission to use the diary of Robert Wright; Tim Pettigrew for a photograph and other information about his great-uncle, William Wallace Pettigrew; Tim Burdett for loaning the photographs of the soldiers digging trenches and last but not least staff at Manchester Central Library Archives who steered me in the direction of the Parks and Special Foodstuffs Committee minutes – helpful and courteous they even carried the heavy and dusty minute books to the reading desk!